This entry was posted in 1980's, 1990's, Clubbed Out and tagged Caesars Palace, Rogues. Bookmark the permalink. 16 Responses to Rogues – what a club! It was certainly there in the 80s and it would have been new then. I can remember going there in what would have had to have been 83/84. I remember Ceasers Ipswich and Ceasers Underwood very well, played there with many bands, Di was the DJ at underwood then she went to the Jet Club at Cooloongatta. Ceasers Ipswich was upstairs and a pain to lug in, I dont think they were owned by the same people…..both were great gigs in the early 80′s. Rouges was the best nitclub ever i whent every fri n sat night always won the aumutre strip n then started stripping there in friday arvo i miss the people expecially BRENDON LONG HAIRED BRENDON… Oh n good old jerry harington.. if any one knos where he is pleae get him intouch with me jodie henderson facebook……. If that was the Friday arvo show late late 1990,s I worked security. Had a lot of fun and played pretty hard. I would then work Friday and Saturday night with Deano, and Tim and Itti Toko. 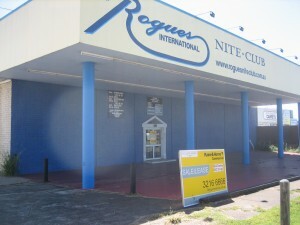 I was the DJ at Rogues around 1989 / 1990 after Mark. I was the DJ at Beenies, later Krystal’s Niteclub at the Beenleigh Tavern beforehand then Ralph invited me to move to Bundaberg to DJ at his hotel, The Young Australian. After that I moved back to Brisbane and started Dj’ing in the city at Wall Street, Transformers, The Beat and then Club 131. The place often reeked of vomit (see earlier comment about availability of cheap jugs of run & coke) when you walked in…you accepted this as the price of cheap and easy access to booze. It was full bogue, no men i knew danced, we were there for the cheap drinks and we hammered them home…..